Last week I had the opportunity to meet the first Latina Lieutenant on the Lowell PD; Lt. Marisol Nobrega. 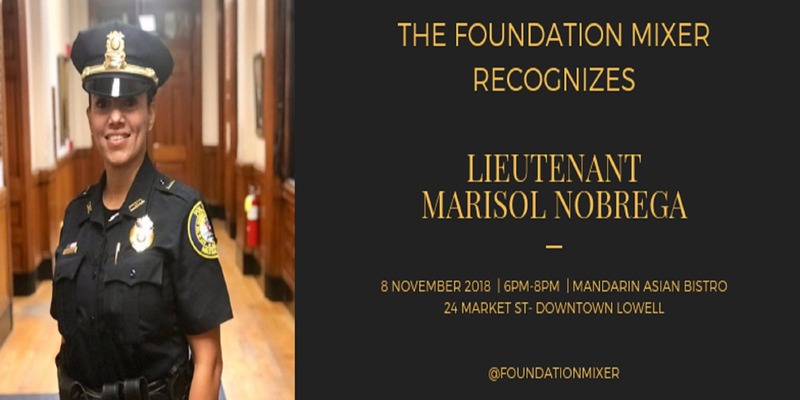 The Foundation Mixer put together an event for the community to get to know Lieutenant Nobrega and highlight her story. I had the opportunity to chat with her a bit and I was really impressed by her and how she feels about Lowell. Having lived in Lowell for over thirty years, she can call it home- a home that she wants to protect and serve – A community that she wants to be involved in as much as she possibly can. Lt. Nobrega believes in the power of community policing and believes that without the community and the police department working together it can be difficult for trust to develop. She hopes to continue to build these relationships with the people of Lowell, as she has for many years already. In her new role as Lieutenant, she wants to focus more on the recruitment of new officers of all different backgrounds who can bring their voices from the community and be powerful additions to the Lowell Police Department. On a more personal note, being Puerto Rican just like Lt. Nobrega makes me feel like I am being represented. Representation matters- so much. I feel a little better that someone like Lt. Marisol Nobrega is on the police force and is working so hard for all the people in Lowell. She is incredibly approachable, down to earth, and has a smile that makes you feel welcome the second you start talking to her. Between talking about our favorite Puerto Rican food including “Arroz con Gandules” , “Pollo Guisado”, “Pastelillos” and the fact that she is a great salsa dancer I felt like I was back home on the Island talking with one of my friends. I have to say again, I am again so happy someone like Lt. Nobrega is in Lowell. So many congratulations to Marisol, it was a privilege and honor to meet you.